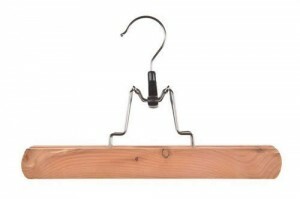 Caraselle Direct – Home Accessories Products Attractive space saving trousers hangers are available buy this. The best storage products are ones that are often very specific to: the type of items you are storing, where you are storing them, how often you need to access them and so on. I mean you wouldn’t consider using a vacuum bag for clothing that you need to get out every day, or trying to fit a full height clothes rail into an awkward space, or even using a children’s clothes hanger to hang your work shirt! Yet on this last point it’s true that some people don’t use the correct hanger to fit the correct clothing item. Recent customer enquiries regarding trouser hangers has led me to talk about what is the best way to store your trousers and what problems you may be having. Let’s start with jeans. You use them frequently and they are heavy, but you don’t really need (or want!) to leave them in a pile in the corner of the bedroom until the evening or weekend. Some trouser hangers will simply bend from the weight, so a hanger designed to take heavy items would be best for this job. 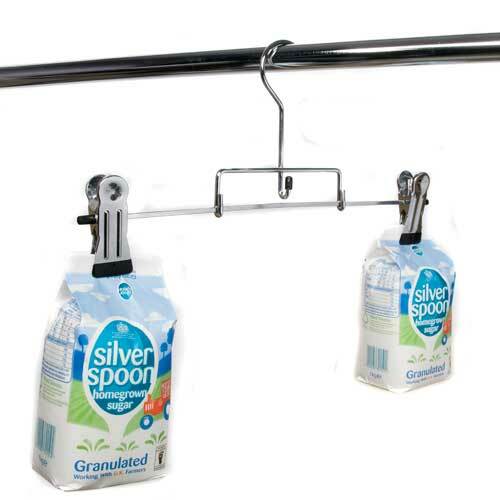 The newest addition to the hangers range – the Deluxe Chrome Plated Heavy Duty Hanger is ideal. 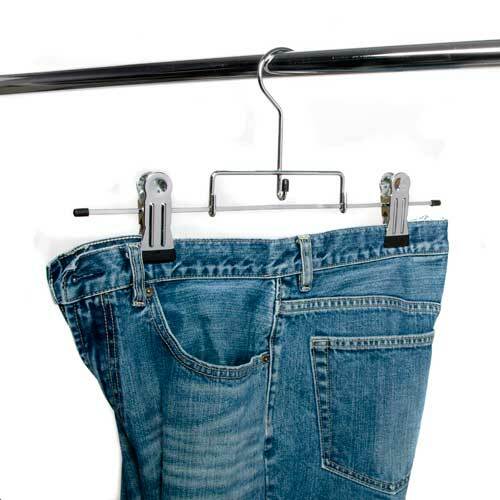 Built with strength in mind being a specialist kilt hanger it has Large Extra Strong Clips, and although ideal for a kilt is also perfect for hanging your jeans and any other heavy trousers! It’s 42cms wide with 3.5cms wide clips. It has an extra hanging hook, which is useful for hanging a belt or other accessory (or for any kilt wearers to hang the sporran). People sometimes find that hanging up their trousers means they end up in a pile on the bottom of the wardrobe, so make sure you choose a hanger that prevents this. They need to be either non-slip, or have a locking bar or clips to stop this happening. With so many varieties available it can be hard to choose. Space can often be the deciding factor however! I’ve recently gone through various space saving options for your wardrobe, and a space saving trouser hanger will keep your wardrobe organised and make the best use of limited space. The brilliant Huggable Hangers (see recent Huggable Hanger Reviews) has a space saving trouser hanger, which will take up less of the valuable wardrobe space. These 4 Bar Non-Slip Huggable Trouser Hangers are available in Black or Pink and with a swivel chrome hook and special flocked non-slip coating your trousers won’t be going anywhere! They really are ultra-thin being only 45cms wide, 43cm high & only 5mm wide! 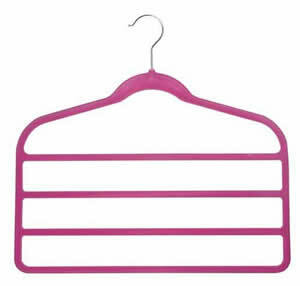 Other space-saving trouser hangers are also available. 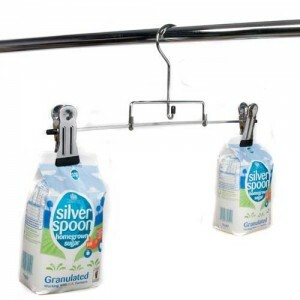 The very popular Deluxe Metallic Silver Non-Slip Trouser Hanger with Chrome Hook is now back in stock – also providing a non-slip solution to your trousers ending up on the floor. They are available in multipacks for even greater savings too. What more could you ask for? Well they are currently on special offer too! Also on special offer is the White & Taupe Non Slip Trouser Hanger, so don’t’ miss out on these great deals while they last! This is a good post, I stumbled across your article while looking for some downloads. Thanks for sharing, I’ll be sure to come back.